Homogenizer accessory for cosmetic, nutrition, paint, food and oil companies. PRO Scientific deflector heads are specifically designed to enhance the homogenization of larger volume and higher viscosity materials such as creams, lotions, oils, gels and much more. They are used regularly by cosmetic, nutrition, paint and oil companies. 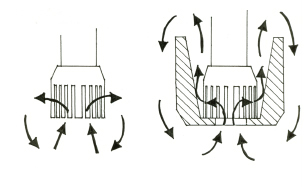 The deflector head design creates vertical movement of heavy materials which would otherwise stand stagnant, and promotes increased flow on larger volume samples. When processing viscous materials, such as creams and lotions, the PRO deflector head forces materials from the generator tip up its tapered walls, creating increased vertical movement of the entire sample. The material is then repeatedly cycled back down to the bottom of the container and up through the deflector head until a homogenous mixture is achieved. PRO deflector heads mount easily on PRO geneator probes. 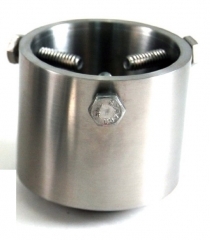 Deflector heads are available in acetyl resin and stainless steel and fit generator probes 20mm in diameter and larger.